Grethe Wirth, UNT alumna and founder of Heirloom Art Co., uses her talent for painting to capture the essence of people she meets. Vibrant portraits with golden halos hang on the walls of her Denton home. Wirth, who earned her degree in art history and drawing from UNT, said she discovered her passion for portraits during a middle school art project. Grethe Wirth, founder of Heirloom Art Co., is surrounded by her collection of vintage pieces. Image by Jessika Hardy. Wirth feels that there is an intimacy and an expressive freedom allowed when painting portraits. Although portraits allow for expression, Wirth still considers the technical aspects of art when painting. Kathleen Clark has been friends with Wirth since their sophomore year at UNT in 2011. Wirth was sitting in on one of Clark’s drawing classes when they met. Clark said that watching Wirth progress as an artist has been a source of inspiration for her. Wirth’s affinity for history extends to clothing, too. Wirth collects vintage clothing and sells them on Etsy. 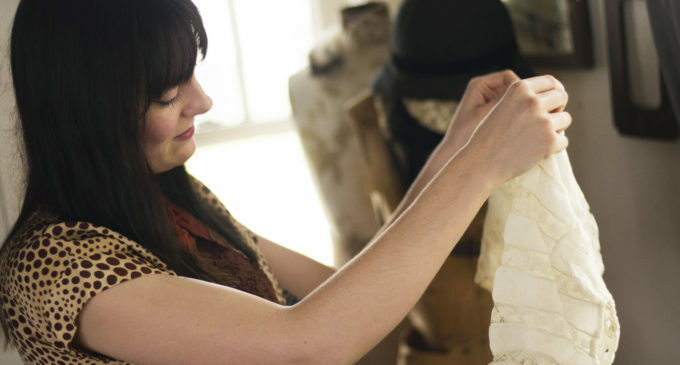 To display her clothing in her Etsy shop, Wirth enlists the help of other women to model the clothes for her shop’s online photos. Grethe Wirth, founder of Heirloom ArtCo., admires a vintage piece she plans to use as her future wedding dress. Image by Jessika Hardy. Wirth incorporates vintage in her art by basing her paintings off of old family photos she came across during college. After graduating from UNT in 2017, Wirth decided to continue living in Denton instead of returning to her hometown of Burleson, Texas. Clark, who has not been creating as much lately, said Wirth’s art continually inspires her as an artist and a person. Featured Image: Grethe Wirth, founder of Heirloom Art Co., admires a vintage wedding dress. 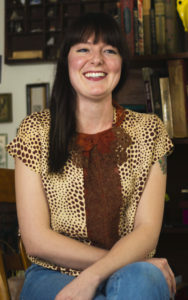 Wirth graduted from UNT in 2017 with a degree in art history. Image by: Jessika Hardy.